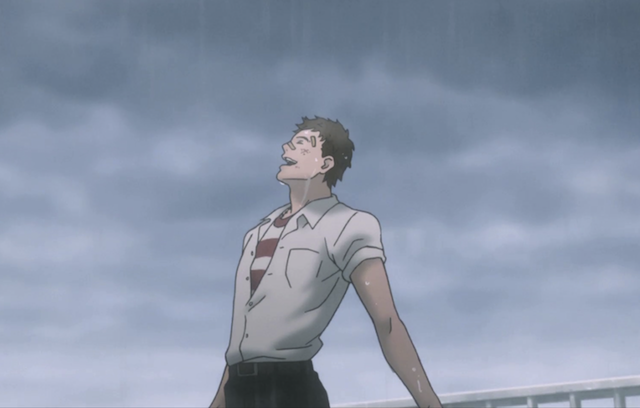 Sakamichi no Apollon 1 ~ Let yourself get a little wet! "His drums just wouldn't stop thundering in my head." 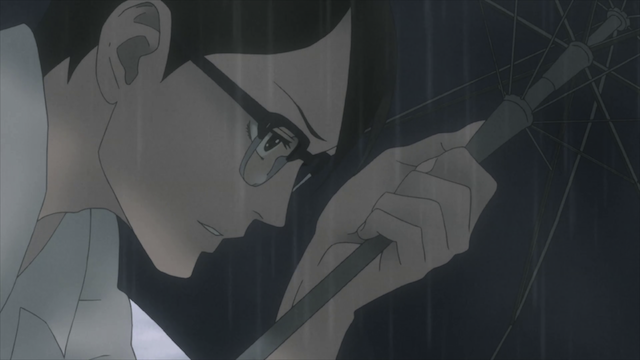 The Spring 2012 season finally feels real now that we’ve got the premiere of the Noitamina shows. 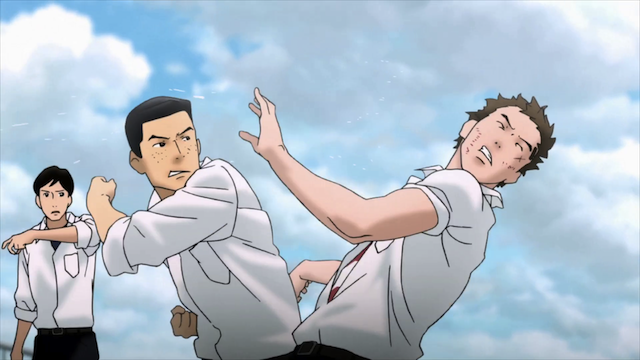 Of course the show to which I have most been looking forward is Sakamichi no Apollon (Kids on the Slope). With Shinichiro Watanabe directing, Yoko Kanno providing the soundtrack, and MAPPA doing the animation, we have the A Team on production. The setting is unusual, in that it is set in the recent past (1966). It shouldn’t be a surprise that the first episode already delivers. This screen cap really shows why it is called "Kids on a Slope". Kaoru Nishimi climbing up the hill. Japanese schools seem to have traditionally been built on the tops of hills. Our main character, Kaoru Nishimi, has seen his share of these slopes. He has moved around from school to school as his father is a sailor, and his mother left them long ago. Episode 1 opens with Kaoru starting over again. He is starting this time in a new school on Kyushu. 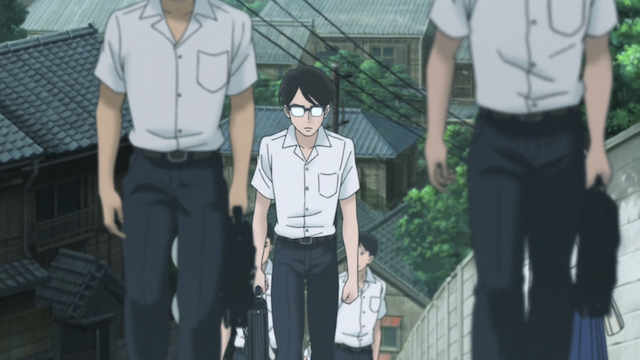 Kaoru’s rootless existence makes him a perpetual outsider. It also makes him a target for bullying. As a result Kaoru has developed anxiety attacks and a propensity for becoming nauseous. There are only two things that Kaoru knows of to calm his anxiety, and keep from vomiting: playing the piano, and going up onto the roof for some fresh air. When the inevitable bullying starts, Kaoru tries to make his way to the roof, but he finds his way blocked. Sentarou Kawabuchi. A case of mistaken identity. 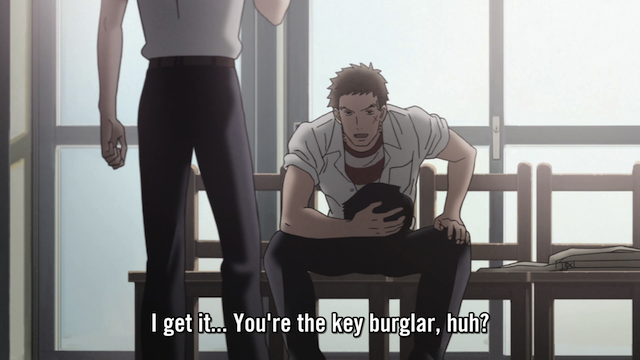 The roof is locked and Kaoru almost gets into a fight with a big scary guy that thinks he has the key. When a group of seniors appear with the key, but refuse to allow Kaoru onto the roof, the big guy, Sentarou, fights them for it. 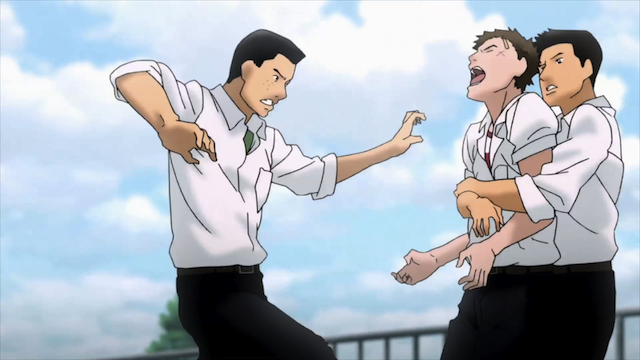 Truly Sentarou ends up taking a beating, but he does get the key, only to be a jerk about it. 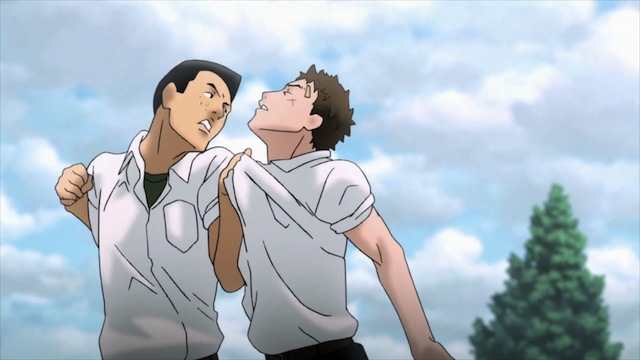 This fight scene was really interesting, though, as it was just one of a number of action sequences in this episode. 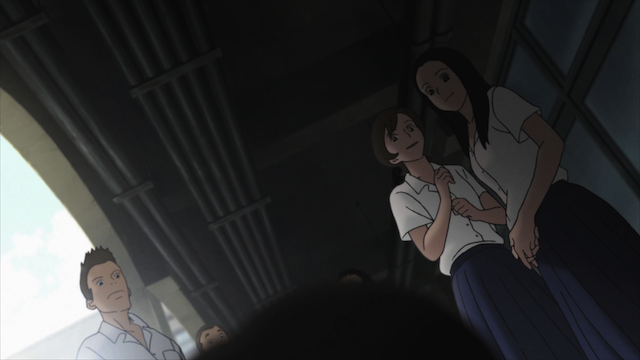 Shinichiro Watanabe did the storyboard for this episode, and I think this shows in how many scenes were carried on animation alone. One of the great things about this fight scene was that the fighting was logical, meaning that people used their body movements to attack each other. That probably sounds obvious, but a large amount of anime fight choreography is really just posing and shouting instead. Here we really saw someone getting pounded. Kaoru Nishimi (left) and Sentarou Kawabuchi (right). 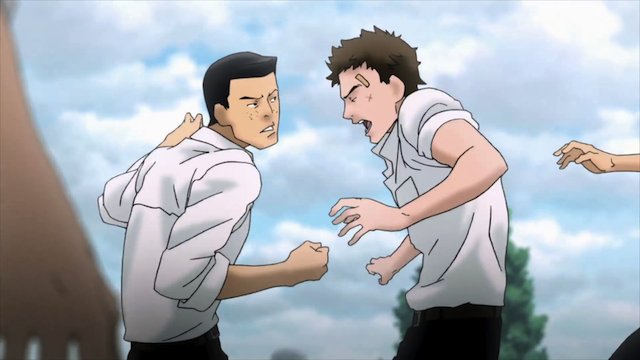 Sentarou has a reputation as a delinquent, so the whole class thinks Sen’s sudden interest in Kaoru is more bullying. Actually it is pretty clear that Sen has a lot more in common with Kaoru than they realize. Sen is very much an outcast. 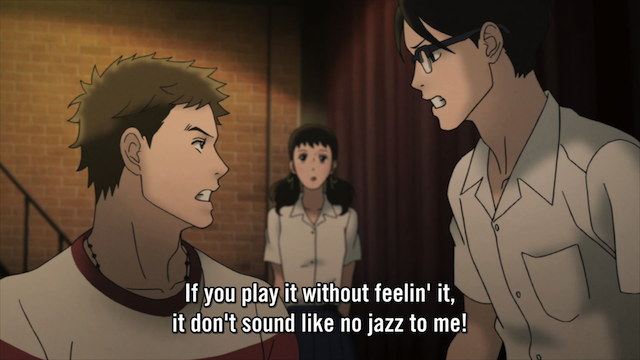 Also, as Kaoru will learn shortly, Sentarou cares about music more than just about anything else. Ritsuko Mukae leads Kaoru and Sentarou by the wrist. 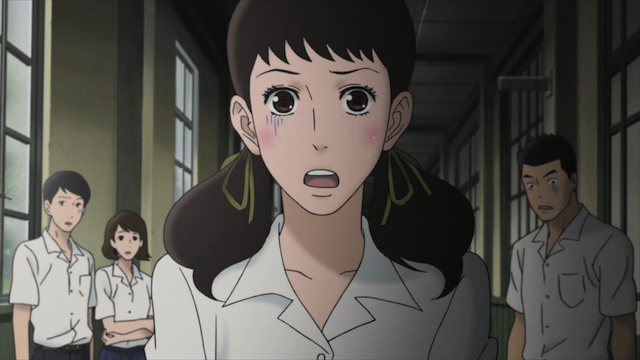 The two boys are also both operating under the watchful eye of Ritsuko Mukae, the “class rep”. Later Kaoru finds out that Ritsuko’s family runs a record shop, and stops by to look at piano records. 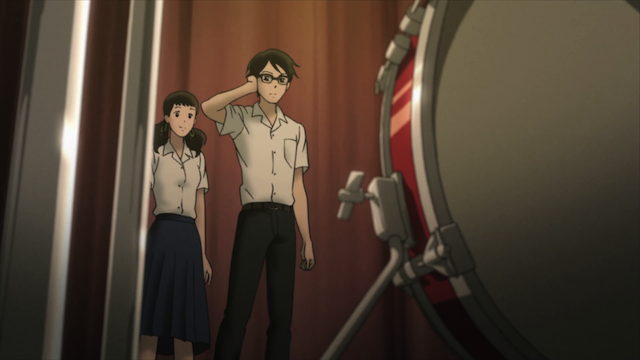 This prompts Ritsuko to bring Kaoru downstairs into a practice space where a piano … and a drum kit … are kept. Sentarou Kawabuchi at the drum kit. This leads to another inspired action scene. 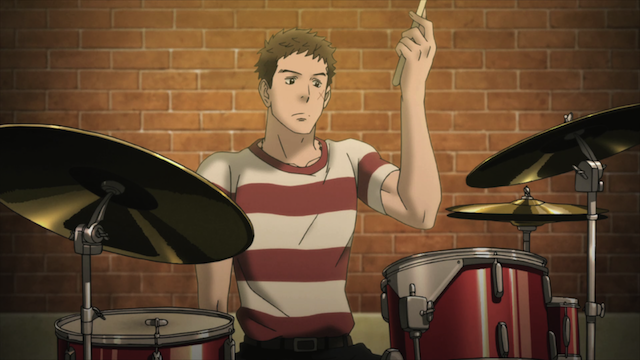 Sentarou is in the practice room, and he lets loose on the drums. The animation here is top-knotch, and a very good sign of the attention to detail we can expect in weeks to come. Ritsuko wants the two to get along and play beautiful music together, but the pair isn’t quite clicking yet. On the other hand, Kaoru is obviously impressed by Sentarou, and learning Jazz would mean an opportunity to come back and spend more time with Ritsuko, so Kaoru buys a classic Jazz album, Art Blakey and the Jazz Messengers. So what’s the moral? Even if you are a social outcast you can still have Jazz. 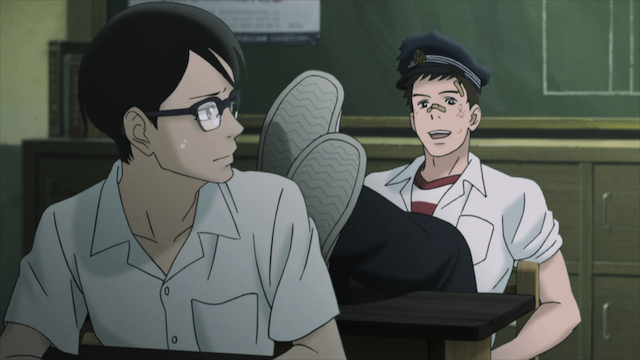 Also you should be watching Sakamichi no Apollon right now. UPDATE: And see Klux’s take on the moral in the comments below! I find it strange I actually enjoyed this episode! Usually I would pass an anime series like this, but there is something fun about the main characters…I guess the interactions between them made me laugh. I’m glad you gave it a chance. I’m sure this is going to be a great show. Yeah, that drum solo was crazy! It was very detailed, and really matched the soundtrack. That shows this is a labor of love. the moral of the story: so long as you follows your passion, what other think of you matters not. Or at least that’s what I think Kawabuchi is teaching Nishimi indirectly. Yes. I was really pumped for this series to start, and the fact that it did not disappoint me, despite my internal hyping is pretty remarkable. Can’t wait to see episode 2.